Many manufacturers struggle with unreliable human machine interface (HMI) applications that use obsolete operating systems. 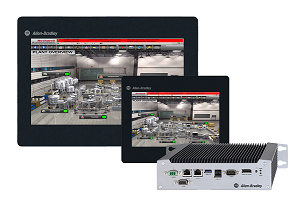 With the new family of Allen-Bradley VersaView 5000 industrial computers, thin clients and monitors from Rockwell Automation, manufacturers can modernise their standalone or distributed HMI applications to support smart manufacturing. The VersaView 5000 portfolio, part of the Rockwell Automation scalable compute offerings, includes five products: VersaView 5400 display and non-display computers; VersaView 5200 display and non-display thin clients; and VersaView 5100 monitors. The display options include an edge-to-edge glass display, a new 22-inch widescreen option, full HD and 10-point multi-touch capabilities to help improve operator productivity. When combined with FactoryTalk View Site Edition software from Rockwell Automation in distributed applications, the VersaView 5400 industrial computers can provide cost-effective compliance with 21 CFR Part 11. The software stores, processes and transmits electronic records and signatures to show which employees have made changes. This is critical for highly regulated industries like life sciences. The VersaView 5200 thin clients, the first from Rockwell Automation, are designed to be the preferred thin client hardware for use with the company’s ThinManager software. The software centrally manages content and visualisation for every aspect of modern industrial operations. It can help reduce downtime and maintenance by simplifying the management of all devices and users. And its location-based Relevance technology from Rockwell Automation can deliver the right content, to the right worker, at the right time and place. When used with the ThinManager software, the VersaView 5200 thin clients can start receiving information as soon as they are plugged in. Device configuration is not needed, resulting in faster device replacement. Because information is stored on a server instead of locally, sensitive information is less likely to be lost if a device goes missing. The ThinManager software also provides multi-factor user authentication, including biometric authentication using fingerprint scanning. In addition to the new 22-inch screen size, the VersaView 5000 portfolio includes 12-inch, 15-inch and 19-inch widescreen options. All screens have 10-point multi-touch capabilities. The VersaView 5000 portfolio also helps reduce maintenance needs. It uses a supercapacitor, which mitigates the need to replace batteries and simplifies air shipment logistics. In addition, an edge-to-edge, all-glass touchscreen reduces cleaning efforts by eliminating the residue build-up that can occur on traditional systems.